You know how sometimes you get so far behind on things, that everything seems overwhelming, even brushing your teeth? You know those times where there’s too much to accomplish, so you panic and freeze and end up not really accomplishing anything? That’s what happened to me last week. On the brighter side, this oatmeal bread is extremely good, you guys! The flavor is lightly sweetened with brown sugar, and tastes a bit nutty from the oatmeal and flaxseed. The crust is properly soft for a sandwich bread, and the interior is close-crumbed and soft. It slices easily, and because of the sugar, it toasts beautifully. Don’t be worried if it looks like its getting too dark while baking; the sugar and butter are helping it brown into an almost caramel-flavored crust. This is one outstanding sandwich bread, so thanks to Foodie Farm Girl for the original recipe! It’s going in my permanent recipe file for sure; it’s going to be a long wait for the year to end, so I can make it again! 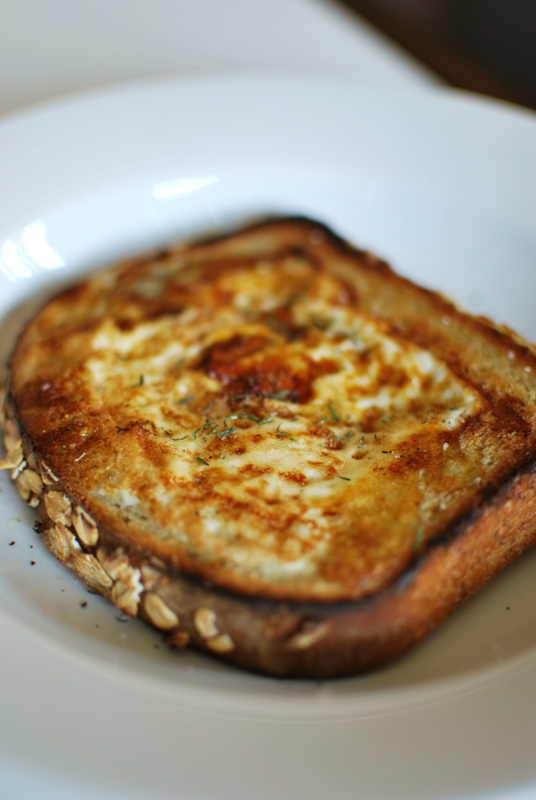 we've been eating a lot of these toads in a hole lately: cut a hole in a slice of bread and fry an egg in the middle; so good! 1. To make the soaking mixture, combine the oats, wheat germ, flaxseed, brown sugar, and butter in a very large bowl. Add the boiling water and stir until combined. Let sit until the mixture registers 80º F, about 45 to 60 minutes. 2. To make the final dough, in the bowl of a stand mixer, whisk together half of the flour with the yeast. Add the soaking mixture, and mix with the dough hook on low speed. Add remaining flour a little at a time until a rough dough forms. Turn the mixer off, and loosely cover the bowl with plastic wrap. Let rest for 15 to 20 minutes. 3. Remove the plastic wrap, add the salt, and continue kneading at medium-low speed until smooth and elastic, about 7 to 8 minutes. Add any additional flour as needed to achieve the proper consistency; the dough should be slightly sticky, but should clear the sides of the bowl. 4. Transfer the dough to a lightly oiled bowl, and cover tightly with plastic wrap. Let sit at room temperature until doubled in size, about 1 1/2 hours. 5. Butter a 9 x 5 loaf pan; set aside. Turn the dough out onto a lightly floured surface. Gently press and flatten it slightly with floured hands, shaping it into a rectangle. Be careful not to deflate it too much. Fold and roll the dough into a 9 inch loaf, pressing the seam to seal. Transfer, seam side down, to the prepared loaf pan. 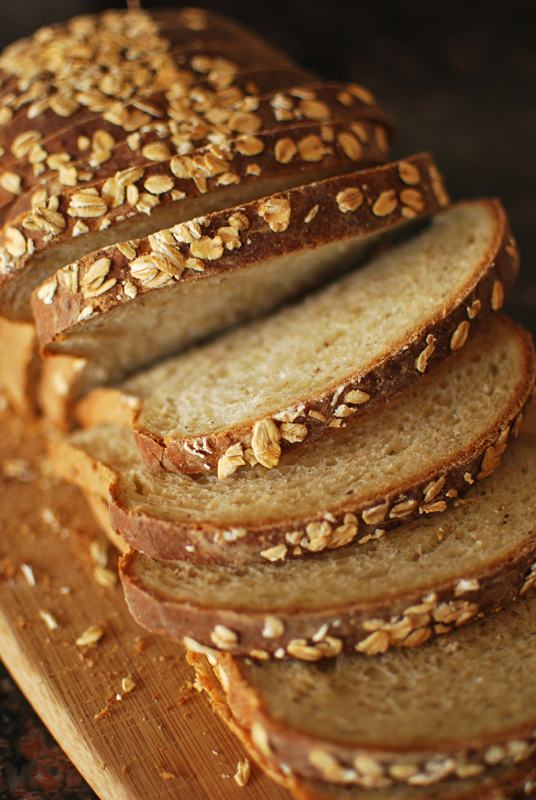 Brush tops of loaves with water and sprinkle with additional rolled oats, if desired (see note 1 below). Cover with plastic wrap and let rise at room temperature for about 1 hour, or until fully doubled in size. Preheat the oven to 375º F.
6. Bake at 375º F for about 35 minutes, or until golden brown. An instant-read thermometer should register about 205º F when fully cooked. Let cool in pans briefly before removing to a wire rack to cool thoroughly before slicing. 1. It’s not necessary to top with the oats, but I sometimes like to know what’s in the bread just by looking at it! If you want a heavier, more even coating of oats on your bread, you can brush the shaped loaf with water and roll gently in a plate of oats. Continue as directed.